I wanted to come on here really quick and give you a little update. I've been trying to update those who follow me on Snapchat (eringoerke) as much as possible, but I also understand that not everyone is on there. Some of you know, some may not, I suffer from Complex Complicated Migraine with Aura (mimics a stroke followed by an intense migraine) and I've recently been doing an extensive amount of tests for increased aura and a "blind spot" I've developed in my vision that we're not sure where it's coming from. I had a medical eye exam, which came back great. I passed all of the vision tests and all of the images of my eyes were perfect. But, that made things even a little more scary as we then knew that the vision loss was a result coming from within my brain. Today, I had an MRI on my brain, with and without contrast and I'm hoping to get those results back very soon. I have a great team of doctors & I'm very optimistic about this whole situation, really hoping it's just some glitch and nothing more. So, ya, this is why I've been M.I.A. on top of this move we're in the middle of. To say the least, things have been crazy around here! I'm so sorry and I promise to be back to posting regularly as soon as possible! Thank you all so much for standing with me and understanding all of this! You are THE best! One of the most common questions I get asked is what do I recommend for fine lines and wrinkles without having to go see a doctor. I have found the biggest difference when using the Clarisonic. If I'm out of town and forgot to pack my Clarisonic, by the time I get home I truly notice a difference in my skin. My skin begins to look and more dull while fine lines start to appear. *No, this is not a sponsored post, nor did Clarisonic send me anything. This is my honest opinion and observation. You don't even have to purchase the Clarisonic brand as there are other less expensive brands out there that mimic this product. I can't tell you if they are as good of quality though because I have never personally tried them but I would guess that they work similarly. Here are two of my all time favorite Clarisonics that I have personally purchased and highly recommend. Note- both of these come with cleansers that I actually really love! & of course, you can also use your personal favorite cleanser and/or exfoliator as well. 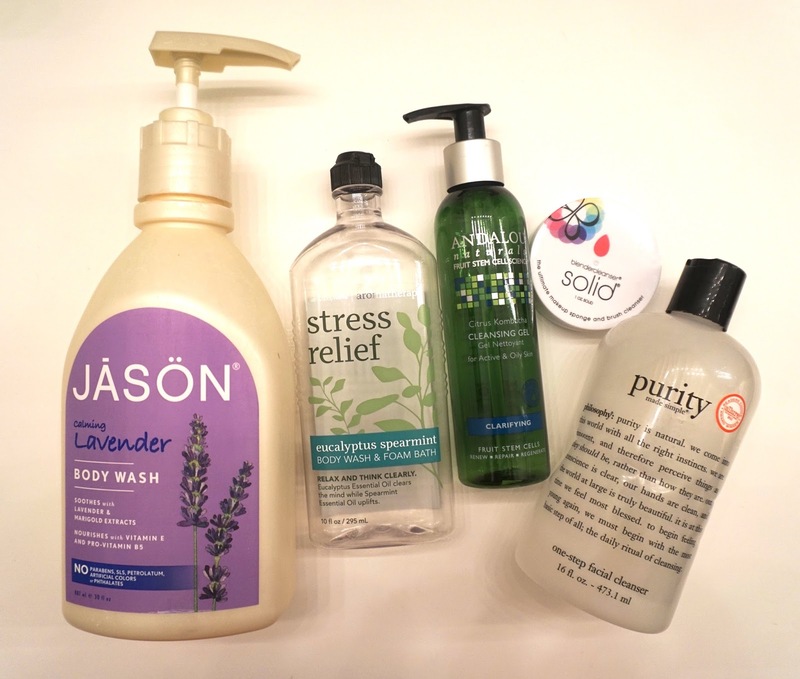 Jason Calming Lavender Body Wash- If you're looking for a great natural body wash that isn't foamy, this is a great one. I go back and forth with body washes but usually like foamy ones so I don't always reach for this one but when I'm in the mood for a silky body wash, this is a great one and I love the smell of this lavender version. Bath and Body Works Stress Relief Body Wash & Foam Bath- This is my fav for bubble baths. I love the scent of this stuff and it is truly relaxing as it's supposed to be. Bubble baths are the absolute best after a stressful day. Scratch that-> Bubble baths are the best every damn day. ANDALOU Naturals Creamy Cleanser- I really like this brand and love this cleanser. I truly notice a difference in my skin when I use any of their cleansers, especially when it comes to dark spots. Highly recommend. Beauty Blender Cleanser Solid- Okay, if you own a beauty blender, this is a MUST HAVE. Nothing, and I mean nothing, will clean your beauty blenders better than this. I have tried many many other ways but always go back to this guy. They knew what they were doing here. Purity One-Step Facial Cleanser- THIS. I'm sure a lot of you have heard about this baby but if you haven't- let me tell you, girl! This might just be my favorite face wash of all time. You seriously can't go wrong with this stuff regardless of what your skin type is and the price is bomb. It seriously never lets me down every single time I go back to it. LOVE IT.